Only one type of jewelry can accent your face shape, your eye color and the highlights in your hair: earrings. Each pair of Native American turquoise earrings at Palms Trading Company is unique, and within the variety of shapes, sizes and stone colors in our selection you’re sure to find the perfect pair that enhances your features. Our selection of Native American turquoise earrings showcases the natural diversity of turquoise stones and cultural diversity among Pueblo jewelry artists. Turquoise earrings use stones that display the range of natural color variations among genuine turquoise stones: yellow-green to sky blue, with yellow-brown vein matrixes, marbling or uniformly colored. Some pieces bring out the colors within turquoise stones by setting or inlaying other gemstones with complimentary colors within each piece. 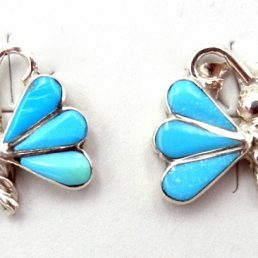 The stones in authentic turquoise earrings may change color over time as the stones absorb body oils and are exposed to other environmental elements. 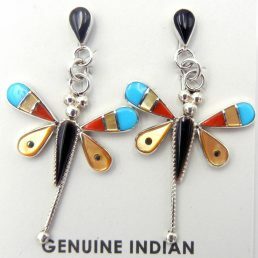 Within our selection of southwestern Indian turquoise earrings, the characteristic styles of each tribe or Pueblo are evident. 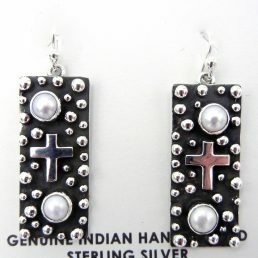 Navajo Indian jewelry uses chunky stones set in sterling silver bezels, some simple, some very intricate or small stones set amidst detailed stamping. 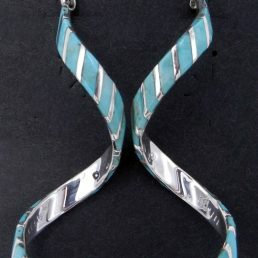 Santo Domingo Pueblo jewelry commonly uses turquoise slabs cut into simple shapes or small turquoise beads to create heishi earrings. 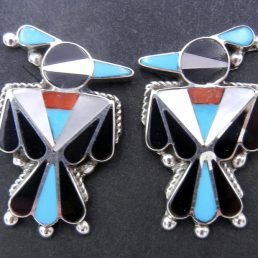 Zuni Native American Indian jewelry artists typically favor the pure sky blue of Sleeping Beauty stones to create intricate needlepoint designs or patterned inlays. Some inlaid designs create a mosaic of common symbols, like the Sun Face. 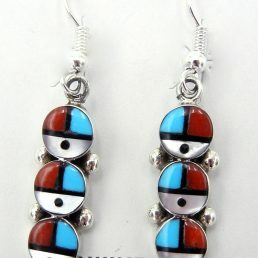 The use of brushed and oxidized silver further adds to the variety of our Native American turquoise earrings. 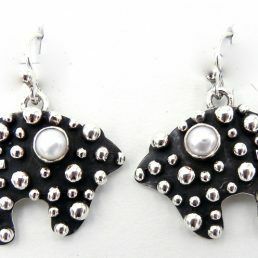 Most pairs of earrings in our online collection are purchased directly from Native American Indian artists, so we guarantee that they are authentic. 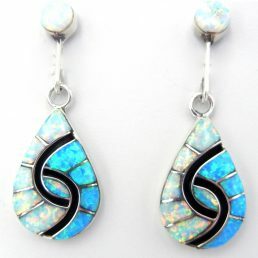 Our artists use the finest materials—sterling silver and genuine turquoise stones. 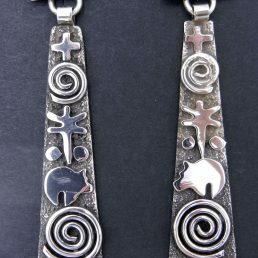 Because of our direct relationship with the artists, Palms Trading Company is able to offer quality Southwestern Indian turquoise jewelry at excellent prices. 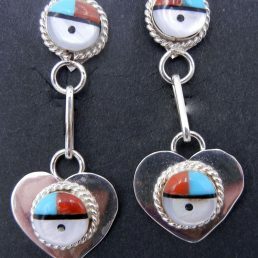 If you have questions about caring for your Native American turquoise earrings or need help from our personal shopper to find something special, please contact us.